I’m not a fitness nut, but I have been trying to keep in better shape. My general philosophy on weight loss comes from a college roommate who stated, “get off your fat a@@ and stop eating so much” – not to make light of an issue that is serious for many people. A few years back, I dropped 30 pounds in a year by taking a daily 30-45 minute walk and more sensible lunches (more salad, less entrees at the cafeteria). When I moved from a large corporate office where I could easily walk the halls and campus to a small office, my daily walking declined. I’ve seen a bunch of friends through social media trying out the various fitness gadgets and my wife got me an early birthday present of a Fitbit One (find my profile here) so that I could track my daily activity. What’s great about the Fitbit (and others) is that it doesn’t require much to use – just clip it on (the One is a small clip-on which I preferred to a wristband) and it can sync with a smartphone or computer. It tracks steps taken, floors climbed, distance/miles traveled, time very active and calories burned. I was especially interested in using the Fitbit to track how much walking I actually do when in Las Vegas (it seems like you walk forever) and also for a hike up Mt Washington in NH. In Las Vegas, it was relatively easy to walk 5-10 miles in a day – my current record of 26k steps was at a recent trip where I walked much of the Strip and a lot inside the convention center and between hotels. 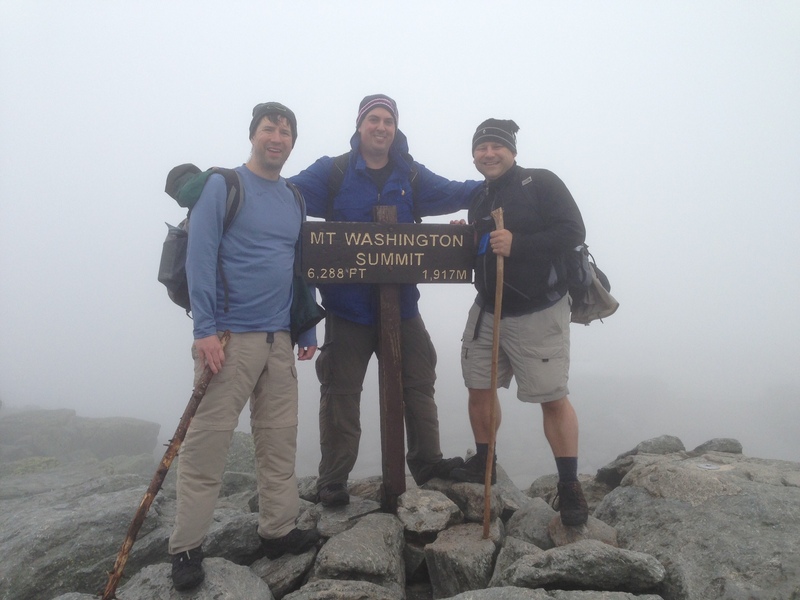 Mt Washington is the tallest mountain in the northeast US with the summit at 6228 feet. I was inspired to do the hike after reading Bill Bryson’s A Walk in the Woods a few years back. Two of my college fraternity brothers, Frank and Gil, agreed to do the hike with me. We did a lot of research and got plenty of excellent advice from people – even on a relatively warm summer day, bring plenty of water (I went through 1 gallon on the way up), layers of clothing (the moisture wicking hiking clothes are highly recommended and don’t forget a winter hat), and good shoes (we all wore hiking boots). We took the Jewell Trail which is the “easiest” up – 3900 ft ascent over 5.1 miles. As soon as we got out of the car, it poured rain on us for the first couple of miles, but luckily stopped before we reached the tree line. A nice thing about the Fitbit is that it is fully water and sweat-proof, so even in foul weather, it worked great. The trail directions had details about which way the trail turned at certain mileage, so having the Fitbit tracker was very useful. It took us about 5 hours to reach the summit – and while it was only about 15k steps, it was over 350 flights of stairs (and the Fitbit badge for 300 flights says that this is higher than any building in the world). Gil and I took the Cog Railway back down while Frank hiked the Ammonoosuc Ravine Trail which took him 3 hours (a much steeper 4.5 miles for 3800 ft of descent). The summit and most of the mountain was socked in with fog. At the information booth, they told us that this is typical for the summer months, they even sell a postcard of “Mt Washington in the Fog”. While we didn’t get to see much scenery on the climb up or at the summit, we did get to see some of the Presidential Mountain Range on the train ride down. I’ll leave discussion of wearable computing like Google Glass for another day; my Fitbit has been a fun, simple and useful tool for me. Thanks to Frank and Gil for helping me cross off this goal from my bucket list. You are currently browsing the Blog Stu - Stuart Miniman blog archives for July, 2013.